With this morning's grand opening of Mine Blower I have now been on all five new rides that opened in Central Florida in 2017. I'll rank 'em. 1. Flight of Passage - Disney's Animal Kingdom. Game changer. It's Soarin' on steroids. Even if you can't remember a thing about "Avatar" you're going to love the sensation of flying on a banshee. Even though you never leave the ground you feel the sensations including the banshee's lungs breathing in and out between your legs. 2. Mine Blower - Fun Spot Kissimmee. Easily Florida's best wood coaster (R.I.P. Dania Beach Hurricane and Gwazi) with a unique barrel roll inversion over the loading station. Rickety as wood coasters are with a ton of airtime hills. 3. Race Through New York With Jimmy Fallon - Universal Studios Florida. Think Minions with Fallon humor, and one of the best queue areas ever as Hashtag Panda parties with everyone in an open space until it's time for your assigned experience. 4. Na'vi River Journey - Disney's Animal Kingdom. The "other" ride at Pandora. It's a gentle boat ride through a bioluminescent rainforest. The visuals are striking. The singing shaman at the end is one of Disney's most advanced audio-animatronics. It's a neat 4-5 minute boat ride if you are willing sacrifice story for ambience. I called it a "beautiful bore" in an article I wrote after kicking the tires during a preview. I've been on it a few more times and appreciate it a bit more, but this is the ranking it deserves. 5. Kraken Unleashed - SeaWorld Orlando. Putting VR headsets on an old steel coaster with plenty of inversions was a gamble, and the ride wasn't as disorienting as I initially feared. I was lucky to be on the first train of the day a few days ago because these take FOREVER to load. Going row-by-row to set up the VR headsets (optional), and then having them wipe down the headsets at the end of every ride (before unloading passengers) finds a new train leaving every 6-8 minutes. It's a capacity killer. My prediction is that SeaWorld replaces the entire ride come 2019 (it already has a river raft ride going in for 2018). I've received a few buyout offers for the Reportedly.com domain over the years, and finally got one that was too good to pass up. I have no idea what the plan is for the domain, but I'm guessing it will be far more ambitious than this humble blog. I didn't want my old postings to vanish. I also wanted to blog about the challenges and opportunities of writing as a contractor. I've owned the WriteField.com domain for more than a decade, and it just made sense as the right domain to talk about the field of writing. WriteField.com originally launched as a platform for editors to find writers and for writers to find work. My vision was a Scriptlance, eLance, or Freelance.com for writers. I paid a programmer to set up a script, but it went buggy before the site gained any kind of traction. The domain sat -- waiting -- until now. Reportedly.com's loss is WriteField.com's gain. No launch is perfect, but Microsoft's rollout of the Xbox One two weeks ago was buggier than usual. There were apparently a lot of systems shipping with defective optical disc drives. I should know. I got one. The story didn't end there. 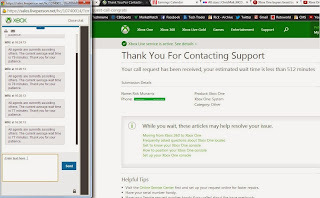 The day after the launch, when I tried to get a hold of tech support to get my console replaced I was treated to three support options. I could wait a couple of minutes for an Xbox ambassador. 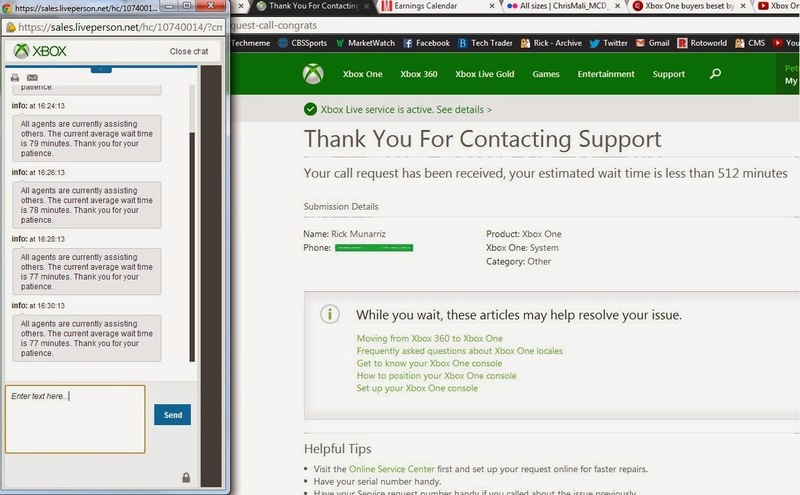 I could wait nearly 90 minutes for text-based chat support. I could get in a queue to speak to a person, where I would be called back within 512 minutes. That's not a typo. The Xbox ambassador was my first option, and I was given an enthusiastic Xbox specialist, but these ambassadors are really just folks from the Xbox community that can help solve simple problems. My busted Xbox One drive -- and if you didn't check out the video it basically makes a cranking sound as the disc won't go all the way in -- was not something that he could handle. The ambassador did tell me that my problem would likely require speaking to a person, so I jumped into that queue. Several hours later I figured I would give the text chat a try as I waited for my service call. The rep was kind and helpful, but ultimately admitted that she couldn't complete my service request since a live phone call was required so I could provide my credit card authorization for the replacement. Microsoft did the right thing by offering those with defective hardware an advance exchange where it places a $500 hold on your credit card as it ships a replacement system. The recipient then has two weeks to return to original one. As this text chat was happening I got the call from tech support. The person calling told me that he would have to transfer me to the hardware replacement department. Sure. Did I have a choice? As that transfer began taking a long time -- after already having waited hours for the call -- my text chat rep received authorization to call me and get my credit card information. I was suspicious, but the phone-based tech support was leaving me out to dry. I accepted her offer and completed the advance exchange. As for the phone transfer to hardware on tech support, I hung up after 42 minutes. I was told, and an email confirmed, that I would be receiving the replacement soon. It would ship in two business days, and take three to five days total to arrive. That was fair enough, but a week later I had not received the Xbox One replacement or a shipping confirmation. I called on Monday, nine days after the initial request. It had not shipped. They were backed up, but I would receive an update within five days. What the what? Sensing my frustration she asked if I wanted to speak to her supervisor. I'm not that guy, but I was hungry for answers. Why was Microsoft telling the public that it was only a small number of defective Xbox One systems shipping out, yet they were so behind on answering service requests and processing replacements? The supervisor wasn't any more helpful. He informed me that he had received a few calls earlier with similar delays, and that they were all made on Nov. 23 (the day after the launch). He informed me that Microsoft did give folks with defective consoles a free digital game, but I reminded him that this was done on Nov. 24, before the two days wait became more than a week. He said he would call me the next day with an update. That was better than five days, naturally. I thanked him. I never got the call the next day. On Wednesday I decided to call again. This was now 11 days after I reported my problem and was promised a replacement shipping in two business days. I was told that it was about to ship. I was skeptical, but left it at that. It was true. It shipped Wednesday night. I received it late Friday afternoon, 13 days after my service request. The replacement console seems to work, but the process has sapped my enthusiasm. Halloween isn't a thankless night. Most kids angling for candy are kind enough to thank you after you hand over the good stuff. Even if you're forking over the bad stuff -- I'm talking to you with the candy corn, toothbrushes, and Almond Joy bars -- costumed kids will still be respectful enough to show some appreciation. Well, something cool happened in Coral Gables last night. When we went out to take our son trick or treating we left a basket of candy outside. We weren't out long, and I was relieved to see that kids and their parents didn't just raid the unattended candy basket dry. That seemed to be the end to another festive Halloween, but then I noticed an envelope in my mailbox the next morning. "Happy Holloween" it read in the kind of scribble that only a child could manage. Curiosity got the better of me. I opened it up, blown up with what I was about to read. Typos aside, isn't that the cutest thing that you'll ever see on Halloween? 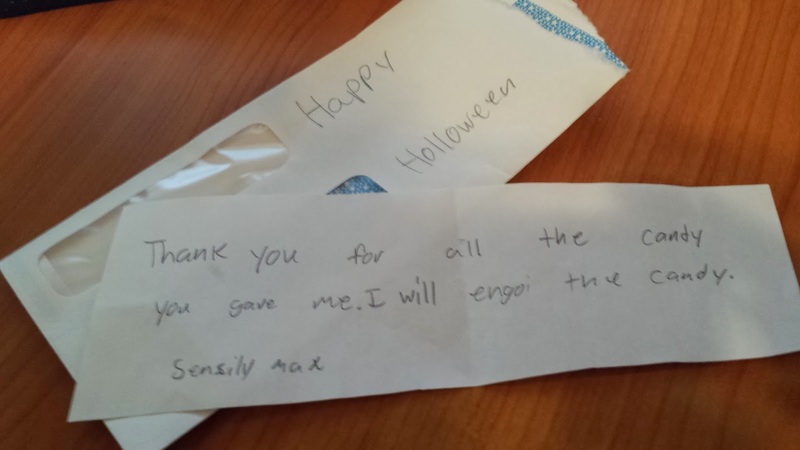 Whether the kid took the initiative to do this on his own or his parents put him up to it, Max -- and I have no idea who he is -- took the time to pre-write thank you notes for the homes he would be hitting up later in the day. Don't lose faith in the youngest generation. They may get it right just yet. Disney nixed the oft-abused Guest Assistance Card system for disabled guests earlier this month, replacing it with the Disability Access Service on Oct. 9. I was able to check it out with my special needs son, and my family's initial impressions aren't kind. Oh, I get that the old platform that let those issued Guest Assistance Cards cut lines was doomed the moment that scruple-free teens and profiteering disabled tour guides slammed the system. It always felt too good to be true to be able to take my son -- who is never good for more than an hour or two at a theme park at a time before sensory overload sends us through the exit turnstiles -- to the park and take in nearly as many attractions as someone staying the entire day. However, the new system is one that will continue to reward those cheating the system while making it a lot harder for someone that truly has a physical or mental disability from enjoying Disney World or Disneyland. Let me go over how the new system works, why it doesn't work, and how easily it will be gamed by insensitive opportunists. Guests get the new pass the same way that they used to by lining up at Guest Relations. The new pass is actually processed, complete with a photo of the disabled guest. It was a surprisingly seamless event, but there is one unfortunate tweak to the new system. Annual passholders were able to get the Guest Assistance Card with expiration dates stretching out for two to three months. We were told that the new pass is good for no more than a week. I've read two weeks, but I was told seven days is the max. Why? There is even a photo on it now. One would think that it would be valid even longer, but instead Disney will make repeat disabled visitors have to head out to Guest Relations more often. When you consider that the passes are popular for parents of young children who have mental or physical ailments that prevent them from tolerating long lines, the new policy of having to queue them up more often at Guest Relations -- likely making that queue longer in the future -- doesn't make a lot of sense. Then we get to how the pass works. Unlike the Guest Assistance Card where disabled guests were either ushered in through the exit or sent to the Fastpass line, a Disney cast member at the entrance to the attraction will check the length of the standby line, subtract 10 minutes for the time that will be typically spent in the Fastpass line and issue that as your return time. The pass will naturally change once automated kiosks are set up, but for now we're going old school with cast members filling in one of the 38 available lines on the Disability Access Service pass and signing off with their initials. Yes, this is better than Fastpass, especially later in the day when issued Fastpass return times are several hours in the future or run out entirely. Getting a special needs child that was used to having immediate access to rides to warm up to the new system isn't easy. Don't get me wrong. The ability to spend that time elsewhere in the park instead of a challenging queue is definitely an advantage. However, that still subjects a family to the typically lengthy standby lines elsewhere. They can also juggle Fastpass reservations like everybody else. It isn't until a Disability Access Service attraction is completed or surrendered that a new ride can be reserved. The one exception that we found to this is toward the end of the operating day. We hit four parks this past weekend, and when we hit up Toy Story Mania at 8:20pm with a 120 minute wait on Sunday -- and the park closing at 8:30pm -- they actually let us go right to the Fastpass entrance with the pass. I guess they realize that having a family with a special needs child rambling around a park for two hours with everything else closed isn't going to work. My biggest tip to anyone having to get the new pass for disabled children that don't do well with waiting is to hit the park during the first hour or two of operation when the lines aren't so bad or to save that marquee long-line attraction to the end where it seems as if they will let you on. I realize that I'm starting to come off as spoiled here, so let's kick in with some personal perspective. My son was diagnosed with brain cancer shortly after his first birthday. It took a few rounds of chemo and more importantly radiation to eradicate the disease two years later. You don't zap the brain of 2 1/2 year old without some serious ramifications. You don't want to see his dental X-rays. You also probably don't want to walk a mile in his shoes where significant development delays and sensory integration issues make everything from a routine traffic jam to someone singing "Happy Birthday" a few tables down the kind of stuff that will send him into a downward emotional spiral. He's not spoiled, though we spoil him. He's not a brat, though many in the vicinity of one of his meltdowns will argue otherwise. Guest Assistance Card was a blessing. It was not only a break for a child that already has plenty of challenges in daily life, but also the source or relief for parents -- and perhaps more importantly the siblings -- of the afflicted child. It was that one rare time where brothers and sisters of the disabled child would celebrate one of the few remaining advantages of the disadvantaged. Mentally and physically disabled kids used to be treated like rock stars. Now it's just a challenge to make it on stage. If Disability Access Service was foolproof it would merely be an inconvenience to the perpetually inconvenienced, but in its original state it's a flop. The honestly disabled will suffer, and the perfectly able that threw morality to the wind and lied to skip lines will continue to do exactly that. That's the problem with the new plan. Abusers can still game the system. A group of thoughtless teens or perfectly capable families that would feign disability by getting a single Guest Assistance Card can now have everybody in their group grab a Disability Access Service pass and keep several reservations open at the same time. There. I said it. The genie's out of the bottle, Disney. How are you going to fix that? There's also the rudimentary nature of the cast members scribbling on the card. The honestly disabled will naturally respect the system, but those that were unethical enough to lie to get a Disability Access Service card will just write in their own return times. Do you really think that those manning the Fastpass line will know the initials of every cast member at the attraction earlier in the day? Of course not. This last point will change once the automated kiosks kick in, but we're talking about at least two ways for the dishonest to keep cheating at the expense of the truly disabled that had their once great Guest Assistance Card program taken away. My experience this weekend wasn't so bad, but I saw a couple of families pleading with cast members at Toy Story Mania earlier that evening about having to come back nearly two hours later. There is little to do at that park to kill time for young kids where the loud shows and scary thrill rides pose sensory challenges. I will continue to renew by charter annual passes -- for now. However, next time out I will also buy premium Universal Orlando annual passes that include Fastpass-ish access after 4pm or stay at one of the Universal Orlando resorts where guests enjoy front-of-the-line access all day long. Disney had to do something to fix the way that the Guest Assistance Card was being gamed, but the American Disabilities Act makes it impossible to ask for proof of the mental or physical handicap. Disney's solution is an insult to the truly disabled that will continue to be gamed by those that are not. If the problem was that the disabled were going on more rides than the abled then going back to a per-ride ticket system would make things fair. As it stands now, don't be surprised if families with special needs children now either stay away from the parks or demand that Disney World and Disneyland begin offering hourly passes since their daily passes are no longer as valuable. One of the great things about writing for The Motley Fool -- and there are plenty of great things -- is that you are encouraged to frame content in a timely manner. Let's take this weekend's debut of Star Trek Into Darkness. From an investment perspective, naturally one can approach it from the studio and merchandising angles. However, I chose to take a popular nugget and turn it into an investment article. One common observation is that folks donning the red shirts when they get beamed down along with Kirk and other crew members are easy targets. They die. How could I turn that into an investing article? Well, how about retailers that are destined to die. These are the retailers wearing the red shirts. It was a fun article to write. They all are. I'm sure I'll get some heat from shareholders of the four retailers that I did single out, but you can't always live long and prosper. Which Stock Could Hit $1K First? I was on CNBC last month, arguing that Apple (Nasdaq: AAPL), priceline.com (Nasdaq: PCLN), and even Baidu (Nasdaq: BIDU) could hit $1,000 before Google (Nasdaq: GOOG). You can see the CNBC video -- it was my fifth time on CNBC (I have also been on CNBC Asia another half-dozen times) -- but I'm bringing it back today because I was proud of the call at the time. I was on the air just minutes after Apple hit a fresh 52-week low of $419, and I figured I had not only nailed the bottom on the consumer tech giant, but I had done so before a global TV audience! Well, it wasn't to be. As of this morning, Apple has fallen below $419. Now, the actual thesis of the CNBC video is still intact. Google hasn't hit $1,000. It may very well be Apple, Priceline, or Baidu that gets there first. However, with Apple and Baidu going on to make new lows after my stint on CNBC's Fast Money it's starting to seem as if Priceline is now my sturdiest horse to make it to that $1k finish line ahead of Google.